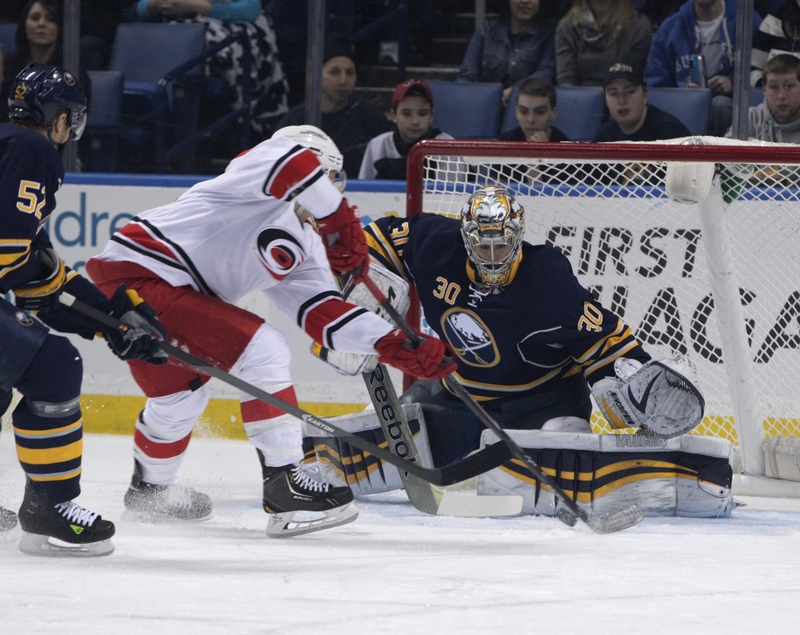 Buffalo goalie Ryan Miller makes a save on Carolina’s Jeff Skinner in the first period. I really hope everyone got a good look at Ryan Miller in his classic Blue and Gold Tuesday night. We already know Miller won’t play tonight against Boston, as Jhonas Enroth gets his return-from-Sochi start. But in what was a remarkable 8-minute meeting with reporters in the press box shortly before the opening faceoff, general manager Tim Murray just about ensured Miller is on his way out of town. And the GM let a big cat out of the bag: It’s Miller’s choice. Enroth will play tonight and thus should play Friday against San Jose. Ditto for Monday in Dallas in the final game before the trade deadline. No way should Miller be in the action anymore. “I’m going to be 34 this year and let’s be realistic,” Miller admitted after making 36 saves to steal a 3-2 win over Carolina. “There’s only a handful of guys who played effectively longer into their 30s. Miller has done just about all he can for this franchise. Murray used the phrase “good soldier” when referring to him and said there are contenders interested. It’s widely believed the St. Louis Blues, currently second overall in the NHL, are at the top of that list. The Sabres are known to covet 23-year-old Jake Allen, a top prospect goalie with the Chicago Wolves of the AHL, in a potential Miller deal with the Blues. Memo to Murray: You want Allen or anyone else, get Miller off the ice. Starting today. You can’t blow this trade by getting him banged up now. Miller, ever the competitor, knows a seat on the bench could be in the offing. Naturally, he wants no part of it. Trading Miller clearly isn’t Ted Nolan’s choice either. Nolan was as down in the mouth as we’ve seen him during his postgame briefing, even though his team had won. He clearly knows what’s coming. • No need to pay attention to the any of those Internet “insiders” when Miller’s own GM says, “I don’t think signing here is his first choice at his age and where we’re at.” That’s pretty much your answer. • Murray said he’s negotiating an extension with Nolan. Good move. Get it done today, tomorrow or the next day. Sooner the better. • Murray is just like Nolan in that he apparently loves captain Steve Ott. But there’s too many teams, especially playoff contenders, who like the sandpaper finish Ott can add to their lineup to keep him. Still, when Murray drops a gem like “Steve Ott is the type of player that I’ve looked for for 21 years,” it’s the first negotiating salvo. You better believe the Sabres are trading Ott – and you better believe in that talking period allowed before July 1, they’re going to be all over bringing their captain back too. With the “For Sale” sign clearly up for pretty much anybody except Zemgus Girgensons, the press box was one busy place. As far as telling you which teams had scouts in the house, it’s easier to tell you which ones didn’t. That list would include Florida, the New York Rangers and Islanders, Anaheim, Phoenix and Calgary. I have never seen such a scout troop upstairs. St. Louis has long been the top target for Miller, but you wonder about Washington and Minnesota, too. And maybe even a trip home to Detroit, where Jimmy Howard’s health remains a question. It’s pretty obvious why the goalie market is tight. If you’re a strong team expecting a deep playoff run, chances are pretty good you already have a solid No. 1 in net. So someone is going to have to take a real chance by moving in Miller and moving out their current guy. What’s Miller going to do over the next week? Any scout watching Tuesday had to be impressed with what they saw from Miller, especially just off the plane from Russia. It should be their last look.